You will find practical tips and legal notes in the appendix. KeyIdentity LinOTP Smart Virtual Appliance can be acquired with a existing LinOTP Enterprise Subscription and Support License. Subscription and Support are licensed for the number of active token managed in LinOTP. You can find instructions on installing the license file during the configuration wizard in part 2 of this Quick Start Guide. 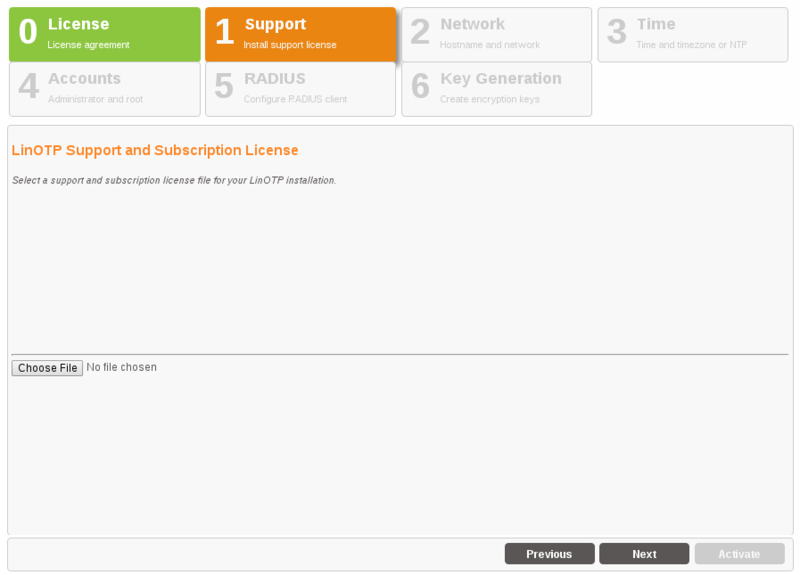 Please have your KeyIdentity LinOTP Enterprise Subscription and Support license file ready for installation. 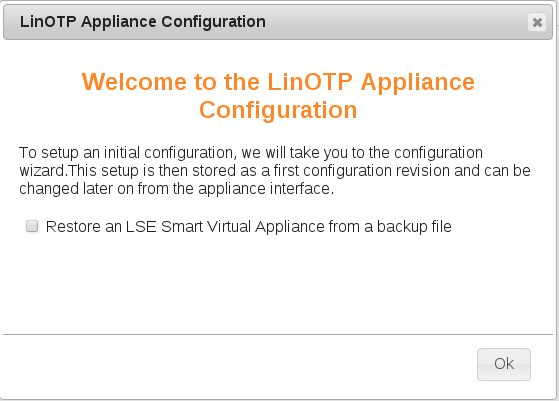 A complete introduction can be found in the LinOTP Manual, which you can download from the Appliance menu using the help function. We recommend conducting all additional configuration of the web interface after installation! 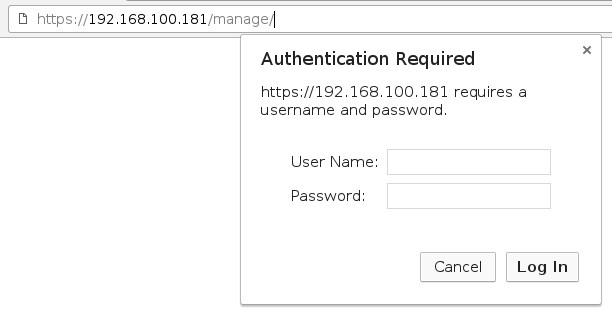 When opening the configuration interface of the appliance https://[IP address of your LinOTP]:8443 , a window will appear with a certificate warning that varies based on the browser used. In general, you should take this kind of certificate warning seriously when visiting websites, as these provide information regarding possible security risks and thus associated risks for the visitors of a website. In the case of KeyIdentity LinOTP Appliance, however, there is no risk. The warning notification appears because KeyIdentity LinOTP Smart Virtual Appliance presents the browser with a self-signed certificate when opened. Therefore, please ignore the certificate warning and confirm the access to the IP address requested (your configuration interface of the appliance). If your browser allows, you can add the IP address of your KeyIdentity LinOTP Smart Virtual Appliance to the list of trusted sites. You will be asked for a user name and password on the login screen that then opens. Enter “root” here as the user name and the initial root password “eBai6Lait9”. For security reasons, you should change this password in the fourth-step of configuration wizard (Configuration – Quick Start, 4. User Roles and Passwords) described in the following. If you have not already done so, open your browser and access the Configuration interface of the LinOTP Appliance as described on page 9 under number 11. You can correspondingly ignore the certificate warning and log on with the root password. Right after the login [Appliance version 2.0 upward] you will be asked whether you want to restore a backup or to setup the new machine manually. Please check the box “Restore an KeyIdentity LinOTP Smart Virtual Appliance from a backup file” if you would like to restore the machine from a backup file. You will see the head of the website changing to contain fewer configuration items. Continue otherwise with the normal setup procedure as described below. Please read the license agreement carefully. To advance to the next step, check the box following “I accept the license agreement” and click on “Next”. By doing so, you declare your acceptance of the license agreement. Browse for your license file ( *.pem file format), which you received with the purchase of your KeyIdentity LinOTP Enterprise Subscription and Support. Activate the license by using “Set License”. Enter the IP address and netmask via which the LinOTP Appliance should be accessed here. Enter the default gateway under gateway. Enter the hostname of the LinOTP server here. You can freely select this hostname, however, it should not already be used by another device in the network. Please enter the name of the domain in which the LinOTP Appliance is located separately in the next field. A list of domains can be entered in the “Search” field that will also be searched. Normally, you will enter the domain names there again. a comma (no comma at the end) separates the lines ‘nameserver...’ in /etc/resolv.conf. In a third step, you can change the date, time or time zone, if necessary. An NTP server can be entered from which the time is automatically received, if applicable. a comma (no comma at the end) separates the lines ‘server...’ in /etc/ntp.conf. LinOTP Administrator – the LinOTP Administrator manages LinOTP. She does not have any rights on the level of the Appliance, operating system or on the network level. The name can be chosen and additional administrators can be configured later in the running system. Appliance Administrator – the Appliance Admin may only change the Appliance functions and provide access rights. They may change passwords, but not the root password. Root Administrator – the Root Admin has the most rights on the Smart Virtual Appliance. He has no access to LinOTP, but can manage everything on the Appliance. Now provide and/or change the passwords for these three roles. The “Old root password” requested for the Root Admin role is the initial root password “eBai6Lait9”. Combination of upper case and lower case letters, number and special characters Once you have entered and/or changed all of the passwords, go ahead to the next step by clicking the “Next” button. Please note that the input mask depicted can only be exited when all fields have been completed and the newly entered passwords are highlighted. Scrolling backwards using the “Previous” button is also not possible until the fields have been fully completed. 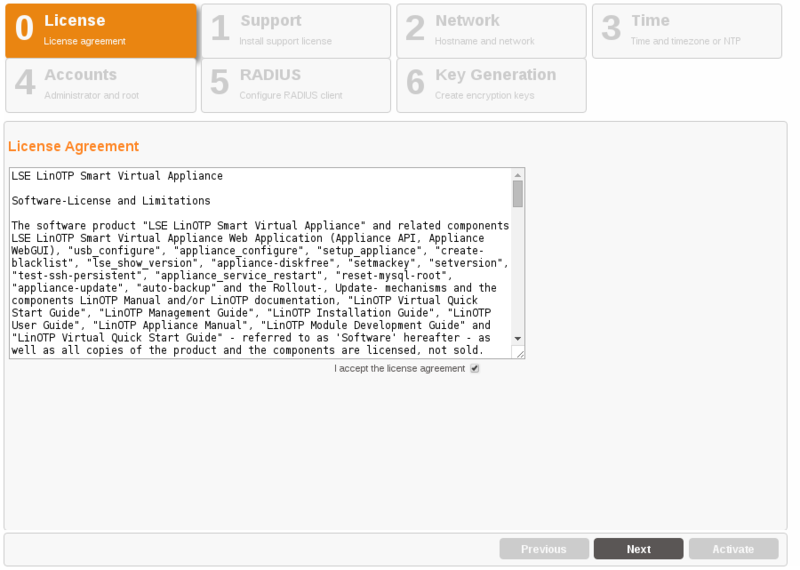 In this step, you will define the first RADIUS client to be allowed to issue authentication queries to the RADIUS server of the LinOTP Appliance. Additional clients can be added and managed via the LinOTP Management after the completion of the initial configuration. 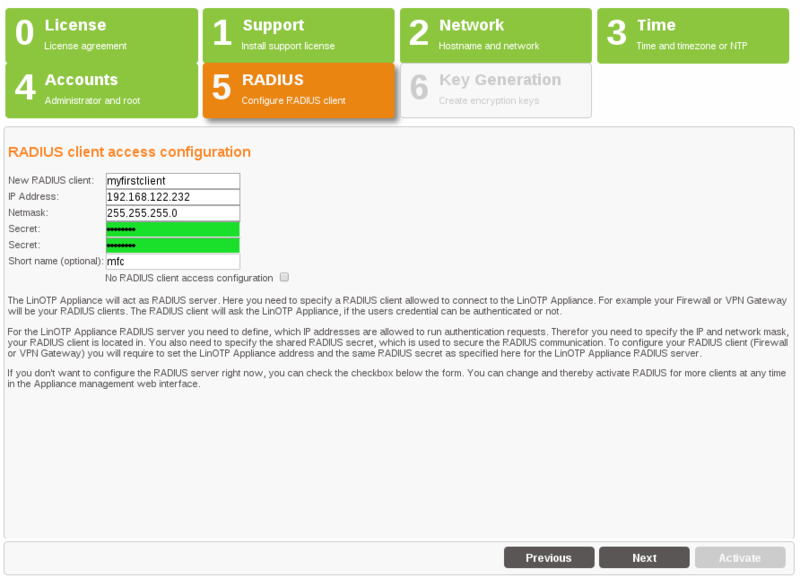 RADIUS (Remote Authentication Dial In User Service) is the most frequently used client server protocol for the authentication, authorization and administration of users of dial in connections in a computer network. One generally distinguishes between the RADIUS server, which conducts the validation of the login query, and the RADIUS client, which sends the authentication query. 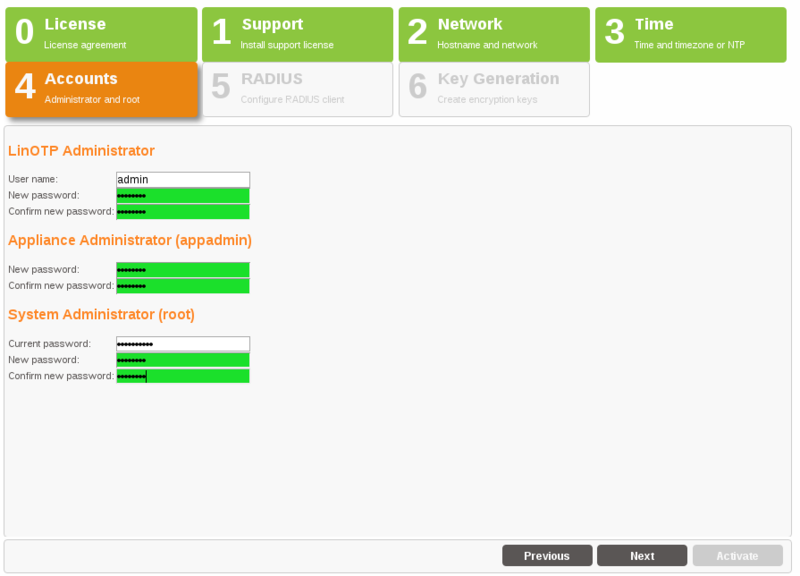 Typical examples of a RADIUS client are a VPN gateway, a firewall as well as a portal server or terminal server. LinOTP naturally also functions with the KeyIdentity RADIUS client “KeyIdentity Radius Credential Provider” which allows you to make a RADIUS-based login to the Windows operating system or Windows Terminal Server. 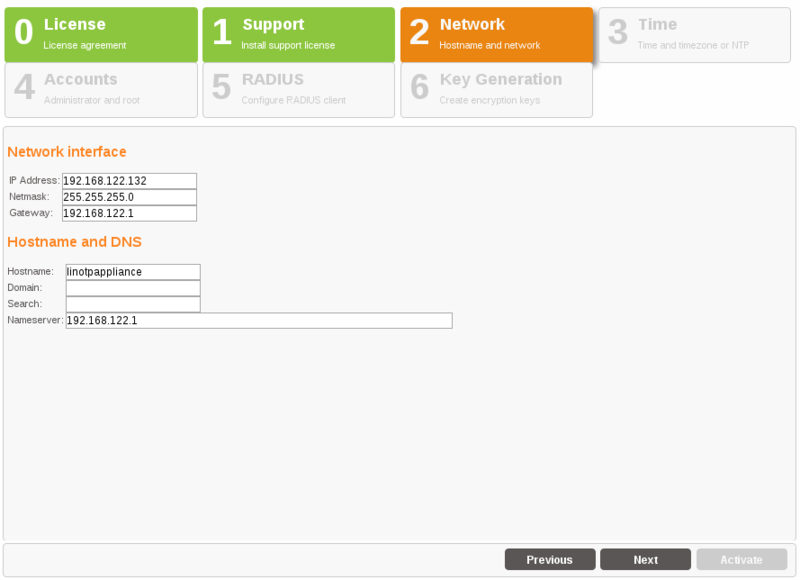 In order to be able to use RADIUS, enter the subnetwork of the RADIUS client (“Netmask”) and its IP address. 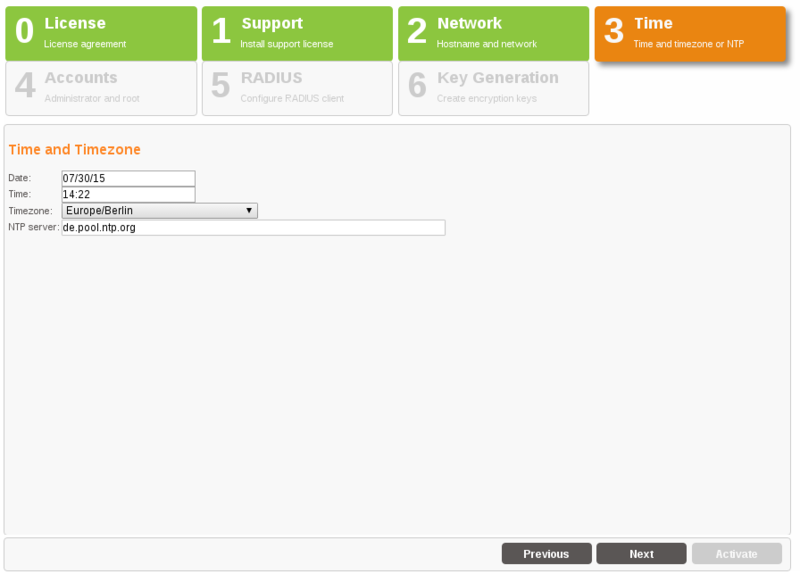 You can freely select the name of the “New RADIUS Client”. In addition, the password (“Secret”) is required for the RADIUS communication. If you do not plan to us RADIUS authentication or want to configure it later, you can check “No RADIUS Client access configuration” and skip the configuration. In the last step, you decide whether the factory installed keys for SSH, SSL and to encrypt the files in the database and the internal database passwords should be generated again. This is absolutely recommended when running the wizard for the first time in order to prevent unauthorized third parties with knowledge of the factory installed keys and passwords from accessing the system or the files. In addition, you can specify in this mask whether the Appliance should be shut down after the completion of the configuration. You should definitely use this option if you have changed the IP address of the Appliance or want to move it into another VLAN. In this case, the Appliance will only be accessible via the new IP address after the activation of the configuration and can no longer be administrated and/or turned off via the existing browser session. 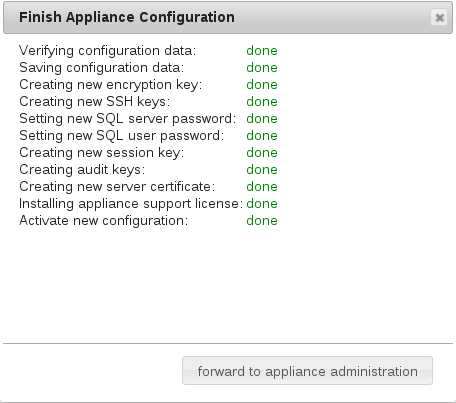 Click the “Activate” button to save all entries, activate and – if selected – shutdown the Appliance. All further configurations can be made from any computer within the network. Open the browser on your administration computer and enter the IP address of your LinOTP server in the address line as you did previously when performing the network basic configuration https://[IP address of your LinOTP]/manage You may receive the certificate warning already mentioned at this point, deal with this as described on p. 10. Then log in with the access data of the previously defined LinOTP Administrator (the name can be freely issued before). User ID Resolvers are required in order to make a connection from LinOTP to user directories. These can be LDAP based directory services (Microsoft Active Directory, Novell eDirectory, Open LDAP, amongst others), SQL-based databases or flat files such as /etc/passwd. A User ID Resolver represents the connection to the respective directory service or respective database. LinOTP only requires read permissions for its access to the target systems. In the start screen, select the item “useridresolvers” in the “LinOTP Config” menu. In the window that opens, click on the option “New” and select the correct directory type (we will choose LDAP for the following example). Server URL (the URL address through which the directory service or database is accessible), this can be either ldap://ad1.example.net, ldap://ad2.example.net for LDAP (LinOTP will try to establish a secure connection via StartTLS) or ldaps://ad1.example.net, ldaps://ad2.example.net for LDAPS - a certificate is required for the latter method. BaseDN (Base Distinguished Name), consisting of the domain components. The BaseDN determines the point at which the directory tree of the User ID Resolver begins to search for users. Please separate the domain components into multiple entries, for example, “keyidentity.local” becomes “dc=keyidentity,dc=local”. BindDN (Bind Distinguished Name, also account, account name), what is meant here is the user account with which the access to the directory service is made (only read permissions are required). The form of the ntries that you have to use depends on the underlying LDAP and/or Microsoft Active Directory® (AD) structure. For example, the LDAP directory “administrator@dir.keyidentity.de” would become “cn=administrator,cn=user,dc=dir,dc=keyidentity,dc=de”. The information “cn=user” is required because the “User” is located in the AD directory in our example. This is not always the case. Another, frequently encountered version that refers to organizational units can appear as follows: “cn=test.user,ou=users,ou=keyidentity, dc=keyidentity,dc=de”. Alternatively, the entry “user@domain” can also always be used with AD directories. Bind Password (the password assigned to the BindDN). With AD structures, please also check the box “No anonymous referral chasing” (you can find more information in the LinOTP Manual, chapter I, article 3.2). 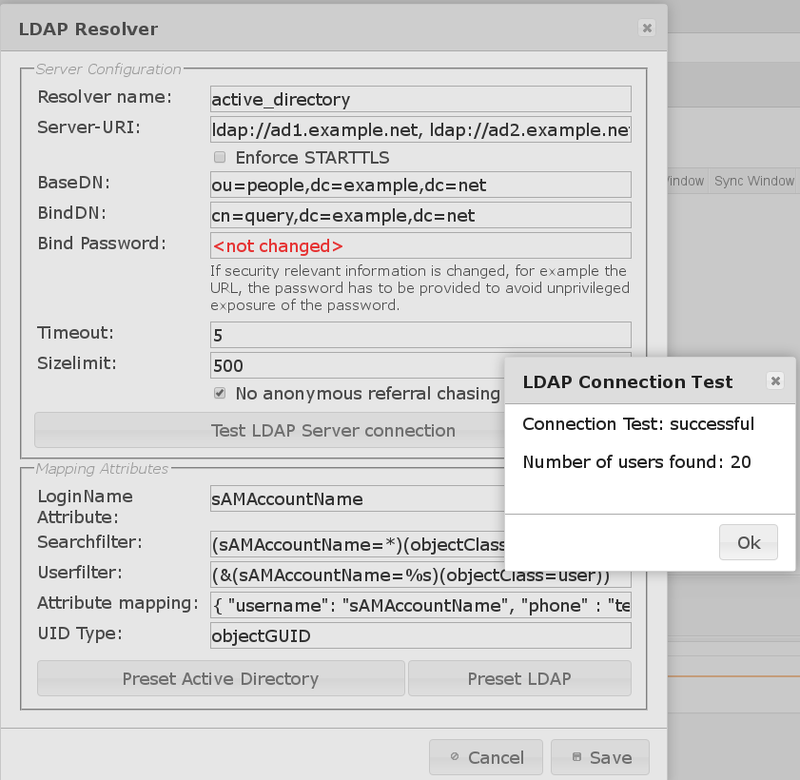 By clicking the button “Test LDAP connection”, it can be verified whether the user directory can be accessed with the information provided. Click the “Preset AD” or “Preset LDAP” button in accordance with the selected user directory type. LinOTP will then automatically fill the fields in the lower third of the screen. Close the process with “Save”. A window will appear that shows the resolver you have created (name and type). You can now connect to additional user directories (“New”), editing existing resolvers (“Edit”) or delete them (“Delete”). To do so, the listed resolvers must be marked (highlighted). Then close this window with “Close”. 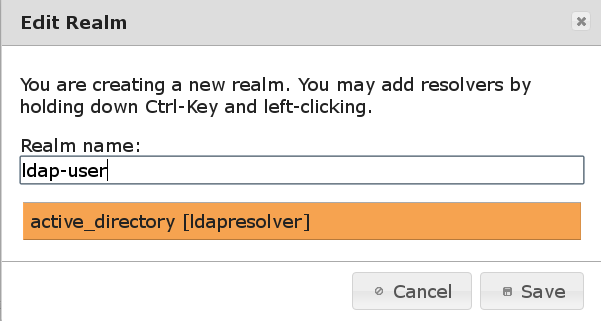 Detailed information about UserIdResolver configuration can be found at Configuring UserIdResolvers. 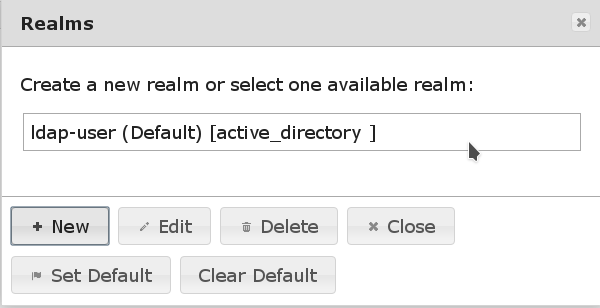 A realm must be created after connecting to the user directory. Realms consist of a number of users that can come from different user directories. They offer extensive options for the grouping of users, which could allow them to be distinguished on the basis of their function or departmental affiliation. Multi-client infrastructures can also be easily depicted with realms. To do so, select the corresponding menu item, “Realms”, in the “LinOTP Config” menu and click on “New” in the window that opens. First of all, enter a name and then select the User ID Resolver of a connected user directory (the selection will be highlighted). You can select multiple User ID Resolver to join them together in one realm. Now the users from the selected realm are displayed in the “User View” tab. You will also find extensive information about this topic in the LinOTP Manual (Chapter I “LinOTP Management Guide”, Section 6 “Managing Tokens”). In order to use the tokens, first import the file with the token seed files (import record). A seed file represents the secret key a token needs to generate the OTP value. 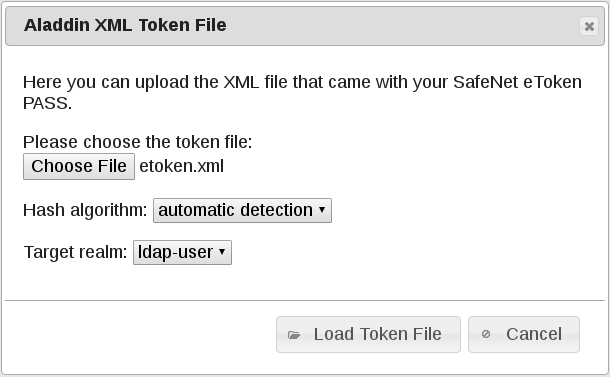 To do so, select the item “Import Token File” from the menu and then the file type (“SafeNet/Aladdin XML” in our example). First find the file with the token serial numbers and accompanying seed fi les that you received from your dealer. Now click the “Load Token File” button to load the token seed file/import record. The tokens loaded are now displayed in the “Token View”. In order to enroll an initial software token, switch to “Token View”. 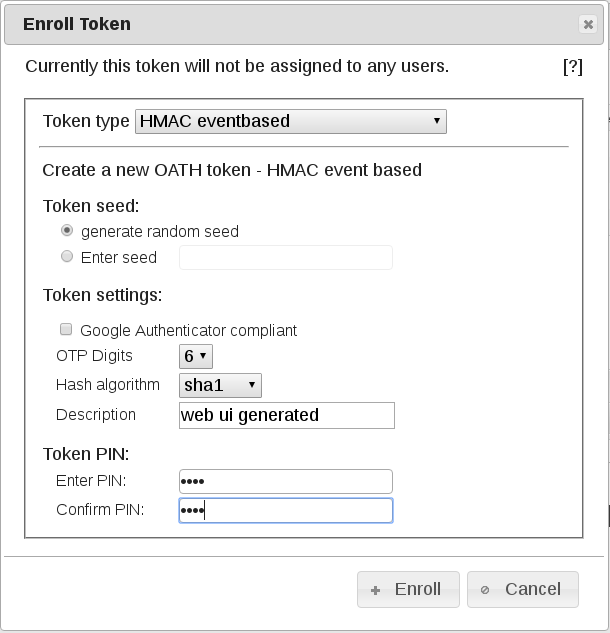 Click on “Enroll” and select “HMAC event based” and “Generate HMAC key” to generate a new seed. 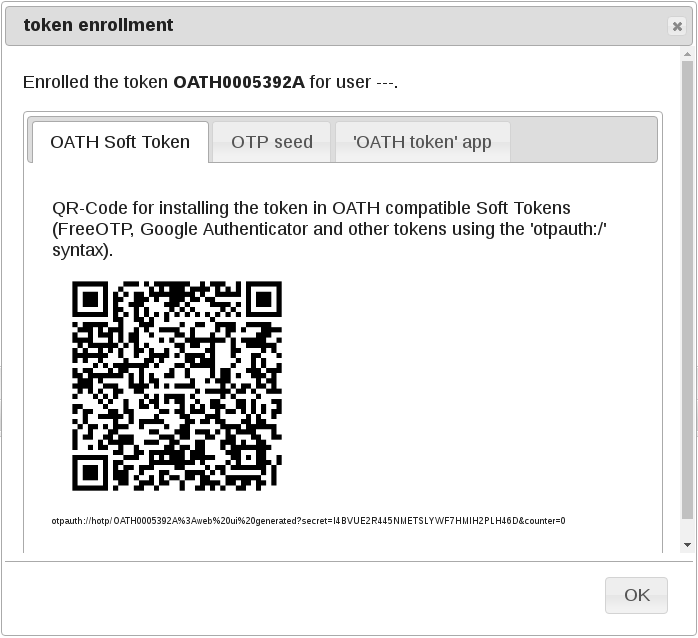 The QR code generated can be read by various software tokens (Google Authenticator or FreeOTP, for example). Now assign the newly loaded tokens to your users. To do so, search for the corresponding user in “User View” and mark them (the entry will be highlighted ). Switch to “Token View” and select the token that should be assigned to the user (the entry will be highlighted). 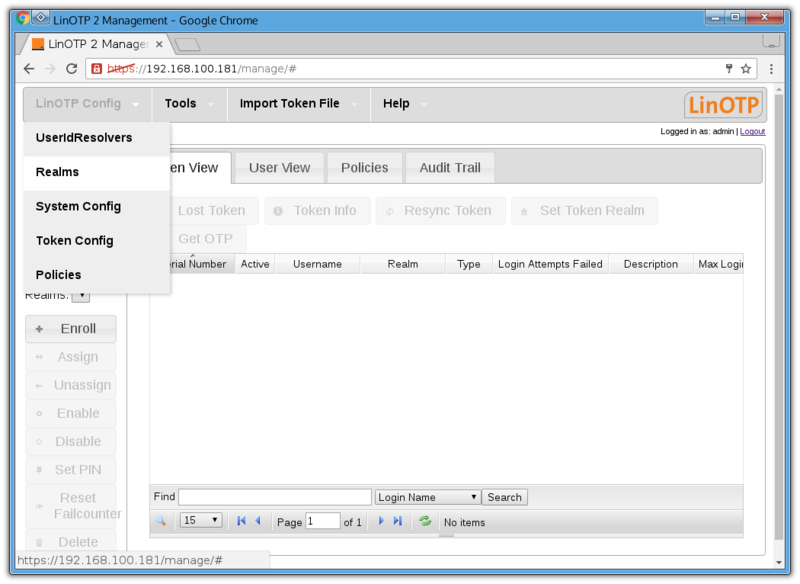 Then click “assign” in the menu to the left to assign the token. If you switch back to “Token View” after this process, the name of the user will be displayed in the corresponding column behind the assigned token. Certain scenarios require a higher level of security in handling tokens. The underlying principle is strong or two-factor authentication. It is more secure than simple typing in a password or showing a card, as a user must prove both factors of possession (token) and knowledge (password or PIN) to receive access. To do so, set a PIN for your token. First select the desired token (the entry will be highlighted). Click on the “SET PIN” button in the left-hand side menu. A dialog window will appear where you can set the PIN yourself. 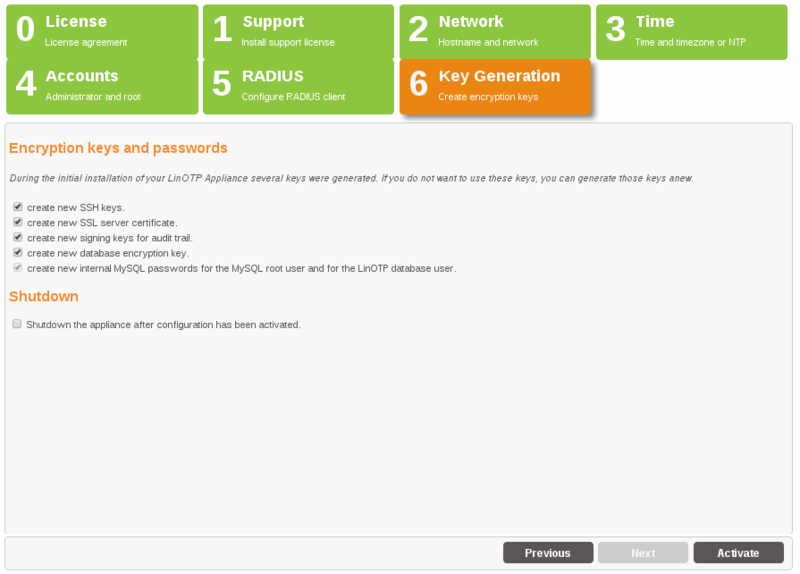 Your KeyIdentity LinOTP Appliance is now fully configured and the tokens have been rolled out and assigned. You can being using your Appliance! Please make sure to correspondingly configure your RADIUS clients before the first use. We have compiled a practical test as well as some useful information and tips for you on the following two pages. Please read these carefully in order to avoid any later complications. We wish you a great deal of success for the use of your KeyIdentity product! Before you place the LinOTP Appliance in live operation, you have the opportunity to test whether all of the configuration steps have been successfully completed using one of the rolled out tokens. Select the token of a user whose user name you know. Type https://[IP address of your LinOTP]/auth/index into the address line of your browser. Enter the user name for the selected token in the login screen. 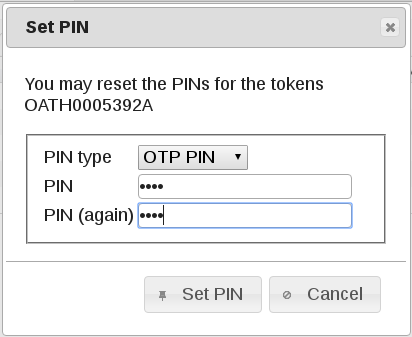 Generate an OTP value with the selected token and enter it along with the OTP PIN. LinOTP will report a successful authentication process to you. If the authentication fails, please check the configuration of your LinOTP Appliance, especially User ID Resolvers and tokens. The audit trail log in LinOTP Management can provide you with useful details for this. Also make sure that you have selected the proper token and that you have not made any typing errors. If you continue to be unable to make a valid authentication, please contact your LinOTP dealer. Backup: KeyIdentity strongly recommends backing up the LinOTP configuration as well as the database at regular intervals. In the event of a defect with the appliance, this is the only way that the rolled out tokens can continue to be used seamlessly and without a new rollout. In Appliance Management, LinOTP offers a func- tion for automating the backup process. Please consult the LinOTP Manual (chapter IV, article 13). Software Update: Our developers work continuously to improve our products. Take advantage of patches and new features by updating the LinOTP Software and the Appliance at regular intervals. Appliance Management also provides an automated function for this; all you require is a valid software subscription & support license in order to use it. You can find more information about this in the LinOTP Manual (chapter IV, article 12). The following table provides an overview of the most important URLs as well as the admin roles. Additional, in part varying, configuration steps are necessary for use in HA mode. You will find an introduction for this in the LinOTP Manual (chapter IV, article 10). The software of the Virtual Appliance, Hardware Appliance and LinOTP are protected by copyright. You can find the complete license conditions at www.keyidentity.de/konformitaet-lizenzen-hinweise.html In addition, they are displayed upon the first use of the Appliance as the first step of the configuration wizard. KeyIdentity GmbH is the leading vendor of secure connection technologies centered around vendor independent logon security and identity management and specialises in information and IT-security for companies. To KeyIdentity’s core competences, the development of security products, count in addition to others the provision of Consulting-Services concerning logon security, vulnerability analysis & penetration tests, encryption technology, storage and virtualization security also IT-Risk-Management. KeyIdentity belongs to the MAX21-Unternehmensgruppe.